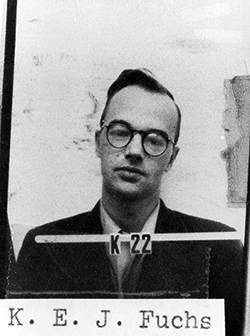 1945: Klaus Fuchs passes U.S. atomic bomb secrets to the Soviet Union for the first time. Between 1945 and 1947, working with a courier code-named Raymond, Fuchs delivered high-level information to Moscow about the atomic bomb, then later the hydrogen bomb. Fuchs was a refugee from Hitler’s Germany, fleeing to England in 1933, where he completed his doctorate in physics. At the outbreak of World War II, Fuchs, still a German citizen, was interned as an enemy alien but soon released through the intervention of Max Born, a professor at Edinburgh University and another German refugee. By 1948, the Americans were aware that the Soviets had people inside their nuclear program, but Fuchs eluded suspicion until the following year, by which time he had returned to England. Confronted by British intelligence, which identified him after cracking a Soviet code, he eventually confessed and was sentenced to 14 years in prison. This article first appeared on Wired.com Oct. 18, 2007.